According to CAMRA, around 29 pubs a week close in the UK. Not the victim of the smoking ban and the £4 pint, but of developers who see the opportunity for luxury flats or commercial premises. At one extreme, landlords can fight back by offering live sport, music and gourmet burgers. 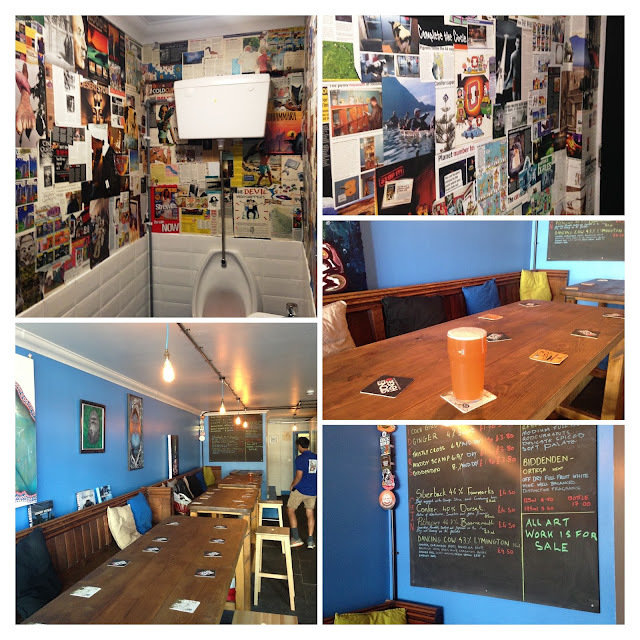 The second option is the micropub. On a bright Sunday in September, I set myself the challenge of conquering Bournemouth’s three micropubs in an afternoon. Had this feat ever been tried before? I suspect so. By bike? The history books are enigmatically silent on the subject. 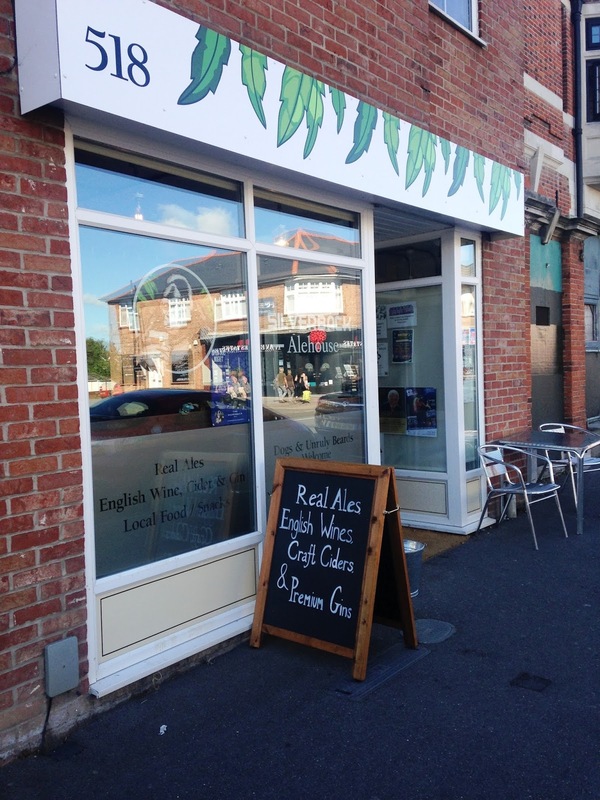 There are currently more than 250 pubs in the UK affiliated to The Micropub Association, which was started by Martyn Hillier from The Butcher’s Arms in Herne, Kent, Britain’s first micropub in 2005. As the name suggests, they’re small, with no bar, music, TV, or fruit machines, and often no mobile phones or children allowed. Rather than serving beer from pumps, they offer a rolling selection of cask ales and ciders. You won't find booths or numbered tables, but rather waist-high counters and benches. And for the most part there's barely room to swing a cat, let alone a pool cue. First up, an eastward slog to Southbourne, the sun on my back, the sea air in my nostrils, and more than once a van just off my right handlebar. I arrive at the Wight Bear just after midday, shaken but not stirred. It’s quiet but my luck is in, because I get the chance to share a jar with regular and local legend Ron Hands, 83, blogger, author, raconteur and former doorman at the Royal Bath Hotel. His status is honoured by the fact that he's drinking out of a pewter tankard. I settle for a half of Vibrant Forest. 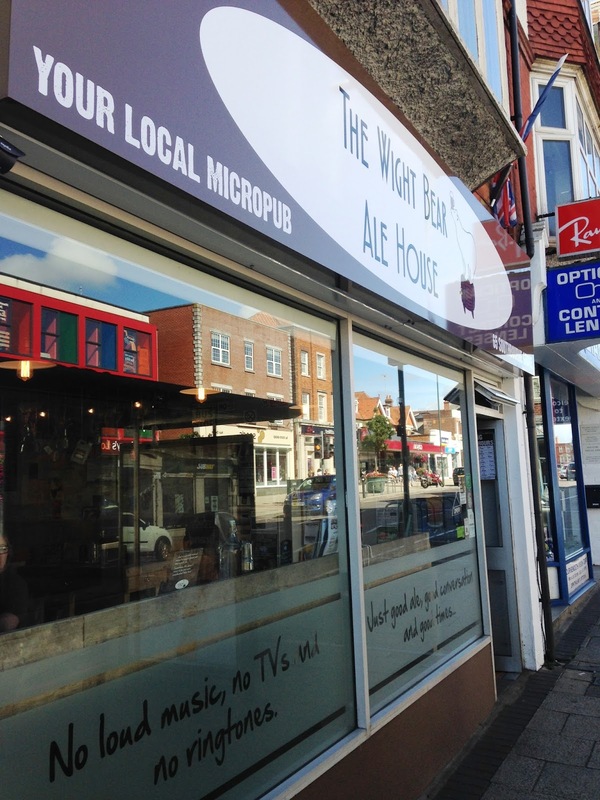 The Wight Bear is affiliated to the Micropub Association and was opened by David and Nicola Holland in 2015, who subsequently opened the Saxon Bear in Christchurch. It serves 6 cask ales and 5 ciders, and an eclectic mix of snacks and nibbles. The interior is clean, bright and quirky - bottles of Conker gin suspended from the ceiling and something that catches the eye wherever you look. Although it's quiet on a Sunday, barmaid Lottie confirms that it's usually standing room only on a Friday and Saturday evening. I could imagine, though, that you'd still be able to hear each other talk however busy it was. As it is, I'm happy to take a bench and listen to Ron, almost to the point where I contemplate aborting my mission for the day. Apart from his blog, Ron has featured extensively in the Echo and local/national press, dropping anecdotes that span The Beatles to Laurel and Hardy. You just don't get this level of chat in a Wetherspoons. But the mission comes first, and I reluctantly head back outside within the hour. The quest has started well. Delighted to find my bike still on the rack (a feat I wasn’t able to achieve during a 10-minute passage through Budgens in Swanage) I thunder on to Holdenhurst Road to resume the craic at The Firkin Shed. 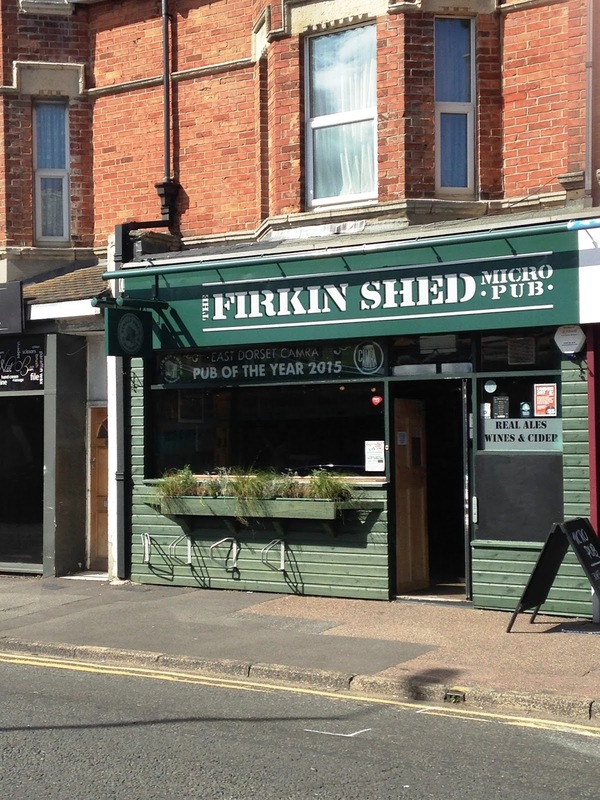 Opened in 2015, The Firkin Shed was Bournemouth’s first micropub, serving 6 cask ales along with a selection of ciders. It’s one of the few pubs in Dorset that doesn’t serve lager, but has the rare distinction of serving Pusser’s Rum from the British Virgin Islands. One for the rum aficionado. The Firkin also serves a selection of homemade pies, pasties, and scotch eggs and the crisp roster laughs in the face of Roystons. There’s the kind of bar that you find in a Soho speakeasy, but it’s already lined by a group of regulars, so I invest in a delicious Totty Pot stout and take a bench. There’s also a tiny beer garden at the back, but the kegs for seating are already occupied. Unlike the Wight Bear, the Firkin Shed plays music, and it’s clearly a niche specialty for the owner. The walls are decorated with old guitars and memorabilia, as well as ghoulish knickknacks and curiosities. It’s part teenager’s bedroom, part man cave. Above all, it's unique. 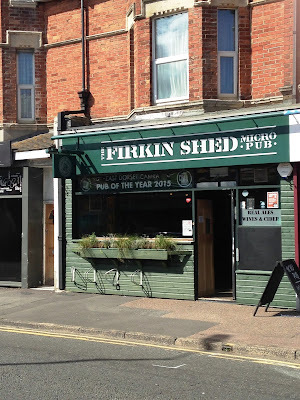 My research tells me that the founder of the Firkin is Paul Gray, a graduate of Arts University of Bournemouth, who salvaged much of the furniture and decorations from skips. Perhaps there's a bit too much going on compared to the Wight Bear, but if you're looking to keep busy there's plenty to choose from. This is a bar that not only appreciates real ale, but also evokes a fondness for lazy, relaxed daytime drinking with pies on the chalkboard, pots on the shelf, and board games or magazines in the bookcase. The only downside, and this perhaps a sacrificial consequence of my research, is that it's hard to break into the action as a solitary drinker. With the regulars already ensconced around the small bar hatch, it feels a bit like intruding in someone's front room - not, of course, an activity much known around Holdenhurst Road. But I'm happy to enjoy a quiet pint, listen to some music and make my excuses. I've got a journey to complete. At this point, I have to interrupt my quest to catch the last half of Aston Villa v Nottingham Forest, which means popping into one of Winton’s rougher-around-the edges Sky Sports pubs. There’s a number on the table, hollering screens on all sides, and a menu of two-for-one burgers and similar microwave meals. 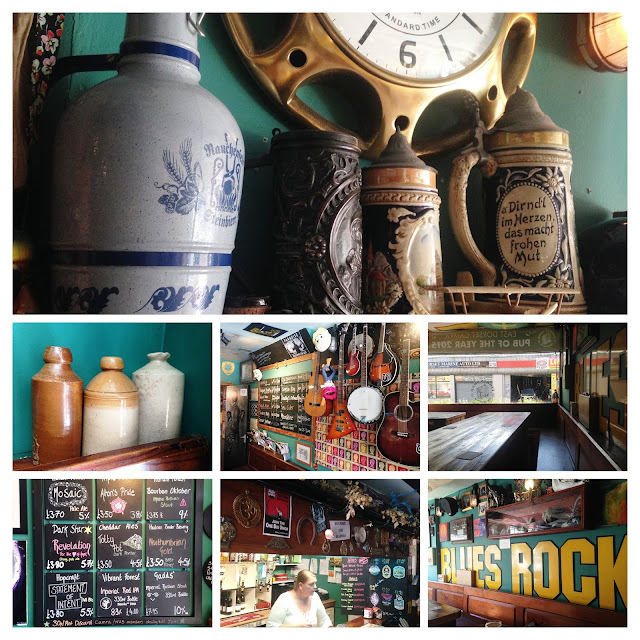 It feels like the kind of place you might grab a pint before catching a flight. Or a fight. I do neither, and reassured with the knowledge that I made a terrible mistake years ago supporting Aston Villa, I return to my trusty bike. Which brings me to the final stop, the Silverback Ale House on Wimborne Road. 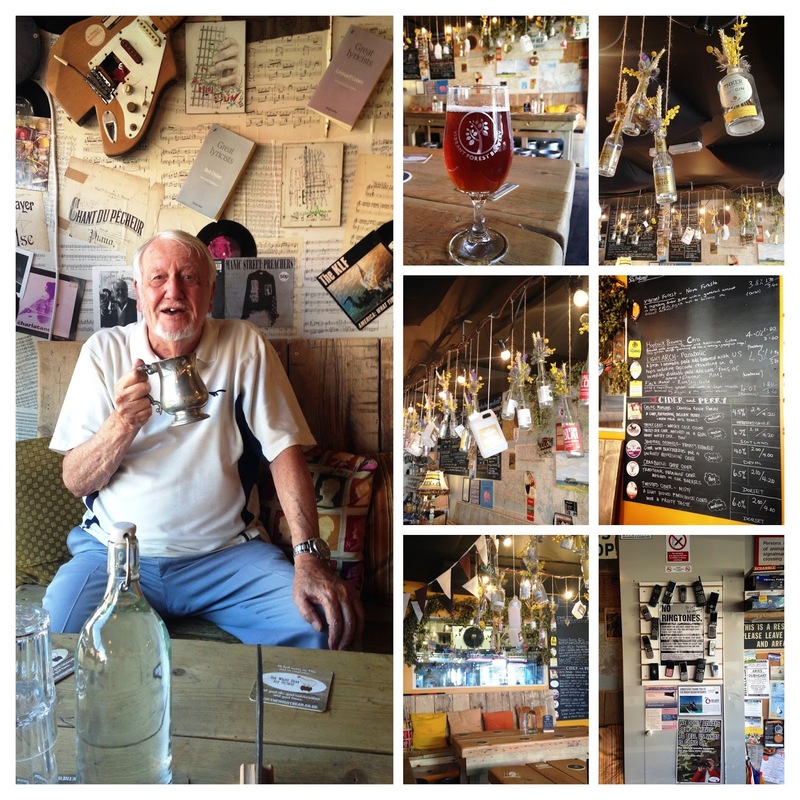 It serves 6 cask ales, 6 ciders and some local gins. The seating is in 200-year-old pews salvaged from a church in Kent. There are three other customers, but they’re all checking their phones and the banter never comes. I’m left to work my way through an aggressively robust Summit Ale, a challenge too far for two other customers who leave their glassed three-quarters full. Yes, cask ale drinking does throw up the odd rogue brew (perhaps literally) but on the flip side the barrels will have all been rotated with some new beers the next time round. Most are gone within a couple of days. It's early afternoon and I'm flagging. The atmosphere inside is a bit like a dentist's waiting room and I'm ready to go home. With nothing much to do apart from look out onto Wimborne Road, I decide to call it a day. Mission accomplished, then, but what did I learn? First off, I’ll be going back to all three soon, this time with friends rather than just a notebook. But for now, I wanted to enjoy the chance to take a bench and enjoy a little quality time with just a pint for company. Secondly, these pubs aren’t for everyone, and that’s their advantage. The beer changes regularly depending on what’s in the cask, so if you like the familiarity of a branded pint, you could end up with something that’s hoppier than a cricket on a hotplate. Finally, there's no escaping the fact that at the centre of a pub - whether it's micro or mega - is the landlord. Someone who ushers you inside, eventually knows your name, and one day might even put you in a taxi. Until Aston Villa next win the European Championship, I'll be saving my pounds for a pint in a micropub.